From the 1971 hit Signs: “Signs signs, everywhere there's signs: blockin’ the scenery, breaking my mind. Do this, don't do that. Can't you read the sign?” In this installment will learn an Italian proverb, a type of Italian hunting, and a lot about bureaucratic speak. Psyched? 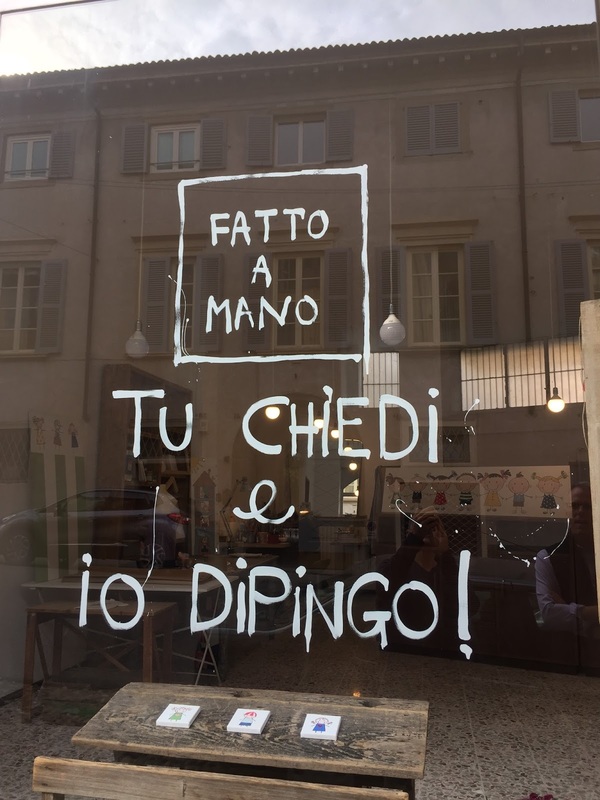 Bergamo shops and signs. Left: Tu chiedi e io dipingo! Center: Egregio Signore. Right: Vietato fumare. Finally, a sign I can understand without reaching for a dictionary. Chiedere is “to ask” and dipingere to paint. This shop was on via Tomaso and it would seem you could have customized the type of painting you buy, however, the shop has recently gone out of business or moved. Non stavi chiedendo e me ne sono andato – “you weren’t asking and I left”? 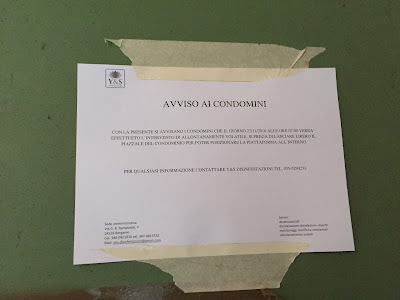 My moment of patting my own back with tu chiedi e io dipingo ended abruptly when I found this sign, which had me scratching my head and reaching for a dictionary. The sentence is formal, addressing the driver with respect, Lei, rather than using a “hey you" tone, which would be tu hai parcheggiato. The verb vigere (vige) is “to be active or in force”. 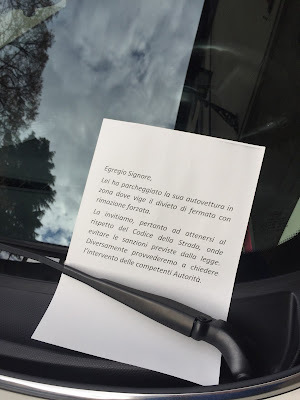 Autovettura is “vehicle”, though many dictionaries like to translate as automobile or car. I’m guessing that parking violations happen often where this photo was taken in front of the university, and the sign is a template that can be printed out and applied to vehicles of all types. Rimozione forzata is “forced removal”, but given the sense of the sentence it is better thought of as a tow away zone. Vietato fumare. 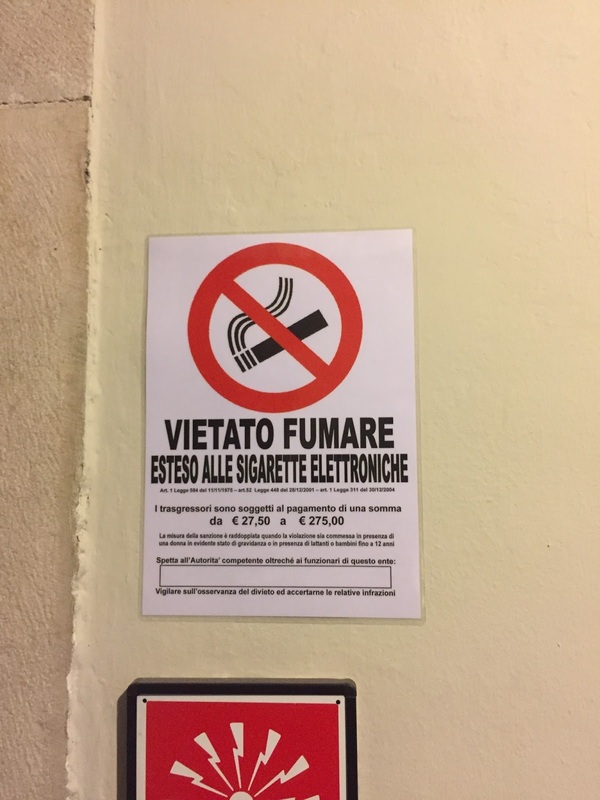 Esteso alle sigarette elettroniche – "No smoking, including electronic cigarettes"
Electronic cigarettes can be called sigarette electtroniche, dispositive elettronici di somministrazione di nicotina, e-cigarette, or just e-cig. However, you call it, you can’t vape (svapare) where this sign was photographed in the library. You can still vape in other indoor public locations. A person who uses electronic cigarettes is a svapatore. 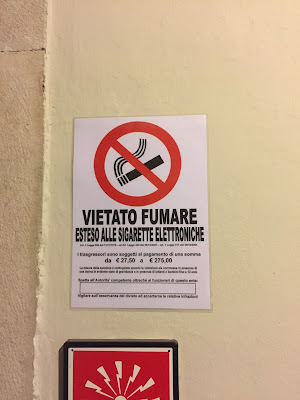 As explained by the Accademia della Crusca, like in English where we use “vape” instead of “smoke”, Italians uses svapare (to vape) instead of fumare (to smoke). Bergamo shops and signs. Left: commentary on some marriages. Center: No hunting. Right: Fresh baby goat. Alcuni matrimoni finiscono bene, altri durano tutta la vita – "Some marriages end well, others last a life time"
Okay, back to the simple sentences. 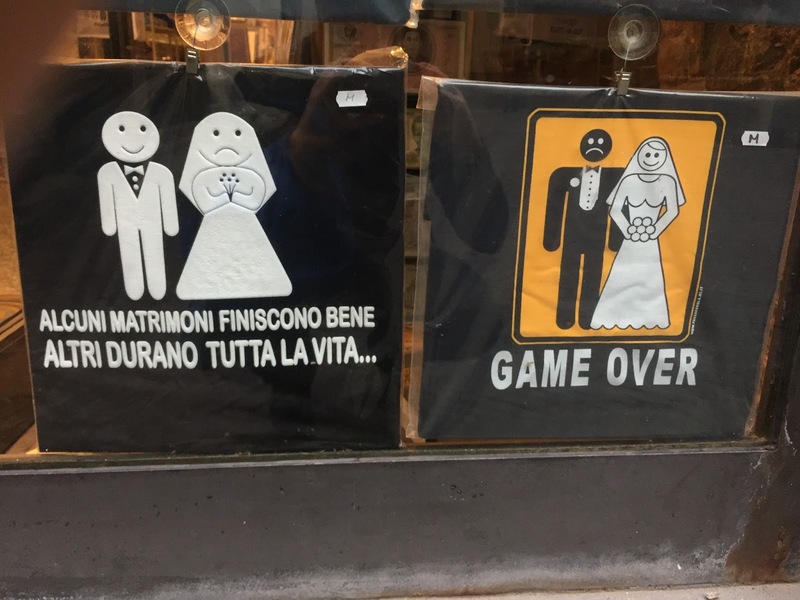 This was seen in a t-shirt shop in Città Alta. This reminds me of a proverb I heard the other day when a husband and wife (where we bring our dry cleaning) were arguing and a bystander said to me: tra moglie e marito non mettere il dito, literally, don’t put your finger between a wife and husband, or better yet, don’t get involved in their affairs. 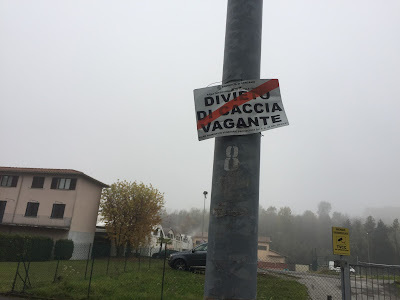 Divieto di caccia vagante – "Stalking/tracking hunting prohibited"
I saw this sign on via Baioni, a stone’s throw from Città Alta. First, I wondered why there would be a no hunting sign in the city (or at least what I consider the city). Second, I didn’t know what caccia vagante meant. The nearest I can tell its hunting by roaming or wandering an area, a combination between stalking and tracking targeted prey, with or without dogs. Caccia vagante seems to be one of the most common and enjoyable ways to hunt, according to the site Caccia Passione (Hunting Passion), and they know what they are talking about! While not exactly on the same level as caccia vagante, we do like wandering into this butcher shop on via Masone because the guy is so friendly, and we can learn a lot about meat. We didn’t end up getting any of the above-mentioned Christmas specials, but I was left wondering why the sign uses tacchine and not tacchini, the normal plural of turkey. 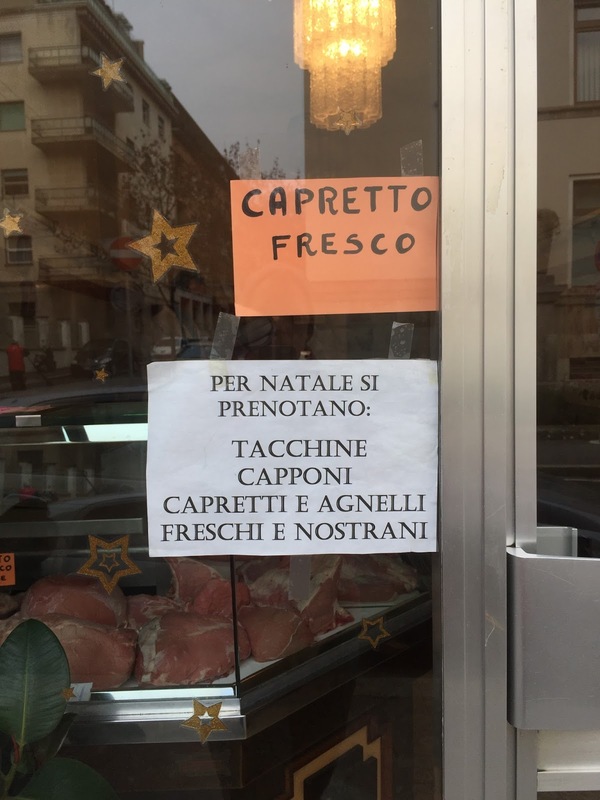 Also, nostrano is a word you see a lot when referring to meat and produce meaning "locally grown." Left: Anti-pigeon. Right: Anti-forgotten dog crap. While on the subject of hunting and meat, we now move to pigeons. This sign appeared in the common area of our palazzo. First, let me say that condominium just doesn’t cut it as a translation. We live in a palazzo! Got it? Condominium sounds like we are in Boca Raton and I’m not liking that image. Second, this sign is and example of typical bureaucratic speak: the translation given above is the gist of the message. The more precise translation would be “there will be carried out a removal of winged animals”. And, there is an error I think: it should be allontanamento volatile. Man, if you are going to use bureaucratic language on me, at least get the spelling right. Continuing on the subject of animals and bureaucratic speak, we have this sign in Città Alta. 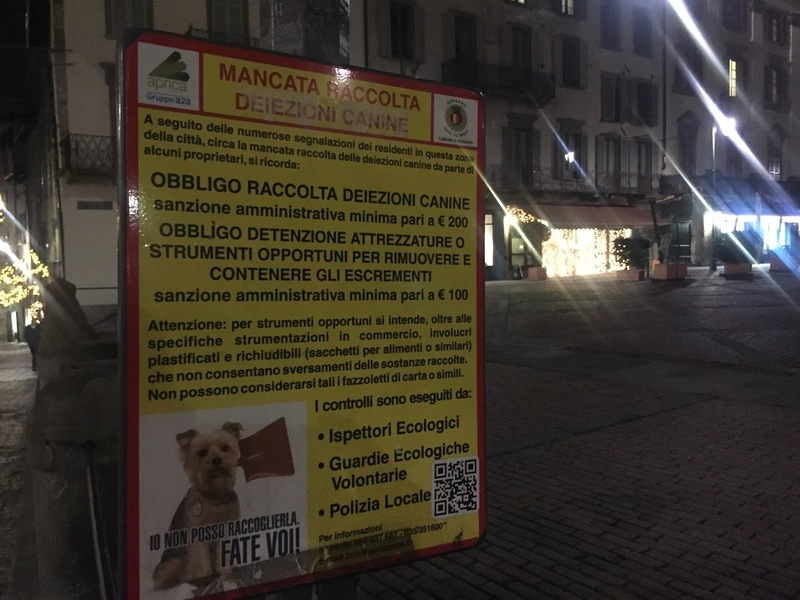 I’ll spare you the whole sign and just talk about the title, which Google Translate gave as “Failure to collect canine deletions” and Bing Translate as "missed canine screening". Deiezione/i is a pretty obscure word, when esecremento/i would have just been fine.